Now launching Avenues Residences Mivida: Strategically located in Mivida's master plan with a close proximity to road 90 and Downtown Mivida. Avenues Residences Mivida provides its residents with the best of both worlds; the tranquility of living in a gated community while enjoying a vibrant lifestyle with the Shopping Boulevard and Mivida Mall just around the corner. Areas starting from 95 sqm to 200 sqm. الآن إطلاق أفينيوز ريزيدنسز ميفيدا: موقع استراتيجي في المخطط الرئيسي ميفيدا مع قربها من الطريق 90 ووسط ميفيدا. 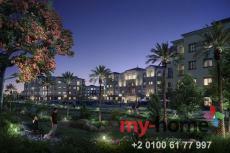 يوفر Avenues Residences Mivida لسكانه أفضل ما في العالمين. هدوء العيش في مجتمع مسور أثناء الاستمتاع بنمط حياة نابض بالحياة مع شارع التسوق ومول ميفيدا في الجوار. المناطق التي تبدأ من 95 متر مربع إلى 200 متر مربع. Drawing its name from tree-lined residential streets, Mivida’s Avenues is a suburban dream come true.